1: The Temple Of Artemis, one of the Seven Wonders of the Ancient World was located in which Greek City? 2: Apollo was the Greek god of�..
3: The Statue of Zeus, one of the Seven Wonders of the Ancient World was located in which Greek City? 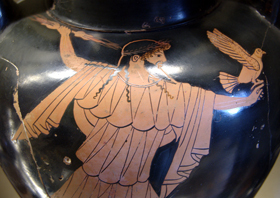 4: In greek mythology, the hero Perseus saves Andromeda from a sea monster sent by which ancient Greek deity? 5: The deity depicted on this attic ware is��. 6: Which famous Greek hero slayed the Cyclops? 9: The Greek Goddess of Love was known as�. 10: According to Greek Mythology, Paris of Troy killed Achilles by shooting an arrow through his�.